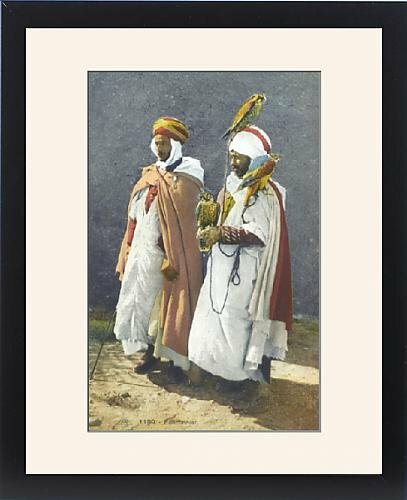 Framed Print of Two Arab Falconers from Saudi Arabia by Prints Prints Prints at Al Dammam City. MPN: s27_7237991_6989_461. Hurry! Limited time offer. Offer valid only while supplies last. FRAMED PRINT. 22x18 inch (56x46cm) Framed Print with Black Satin with Off-White Digital Mat. Artwork depicting Two Arab Falconers from Saudi Arabia. FRAMED PRINT. 22x18 inch (56x46cm) Framed Print with Black Satin with Off-White Digital Mat. Artwork depicting Two Arab Falconers from Saudi Arabia. A very beautiful postcard, depicting two Arab Falconers from Saudi Arabia. One has three of his birds (Peregrine Falcons?) sitting on his arm, shoulder and head! Date circa 1910s. Shipping from USA. Artwork Description... A very beautiful postcard, depicting two Arab Falconers from Saudi Arabia. One has three of his birds (Peregrine Falcons?) sitting on his arm, shoulder and head! Date circa 1910s.